Review by Constance Perry, Ph.D.
Karl Marx wrote, "As individuals express their life, so they are." 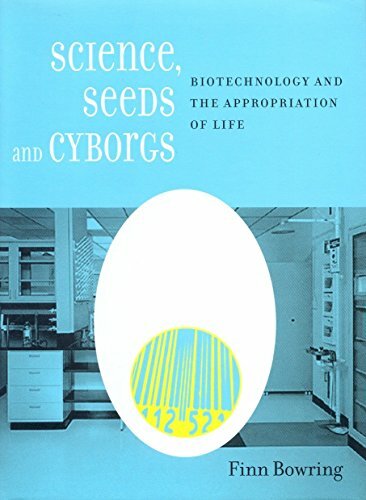 Finn Bowring's text, Science, Seeds, and Cyborgs: Biotechnology and the Appropriation of Life, argues that society's focus on the genomic paradigm is making us believe that as genes (and society's interpretation of them) express the lives of individuals, so they are. Bowring's text is an important critique of modern biotechnology. Its value is in its ability to challenge people to view genetic engineering in new ways. It kicks us off our comfy existential couches to reconsider what is directing biotechnology and humanity's future. Unlike the typical antitechnology paean, this text demonstrates a strong and up-to-date grasp of the relevant science. Bowring provides a wealth of information about genetics and the application of biotechnology to plants, animals and humans. This is presented with great clarity. With his pen, the complex is made both simple and interesting. Bowring uses this knowledge to craft a fairly airtight scientific argument against genetic reductionism. This well laid foundation convinces the reader that this text has more substance than the typical anti-technology treatise. Bowring then argues that powerful forces are promoting genetic essentialism for their own interests. He argues that rejection of the benefits of genetic biotechnology is necessary to prevent significant harm to all life. Some of these arguments are more successful than others. For example, his arguments about how companies are using genetic engineering to boost profits, to the detriment of poor farmers and ecological diversity are not new. But they are backed up with an impressive discussion of specific examples. However, his arguments against pharmacogenetics and gene therapy ultimately rest on the unsupported claim that if society addresses genetic factors of illness, the socio-economic and environmental factors in illness will necessarily be ignored. At times, Bowring seems to be at odds with his own arguments. For example, on pages 185-6, he makes the dubious claim that infertility is not a disease because the cause is often multifactorial or unexplained. While in chapter six, he refers to the multiple and unexplained factors in the cause of such diseases as breast cancer, cystic fibrosis, and Parkinson's (to name just a few). It is inconsistent to use a reductionist view of disease to exclude infertility while arguing against reductionism in the interpretation of other diseases. Such instances hint at the author's own ambivalence about the naturalism at the heart of his thesis. This culminates in his last chapter. In the final chapter, he presents phenomenological psychologist Erwin Straus' essay on the physical state of uprightness as a metaphor for humanity. Bowring describes Straus as saying, as the human body is designed to stand, but must constantly fight gravity to do so, the human spirit constantly strives to rise above nature, but ultimately cannot break free from it. Bowring uses this essay to argue that attempts to attain perfection through genetic engineering are doomed to failure, since perfection is beyond the grasp of imperfect beings. However, this argument ultimately fails because gravity does not make standing up a fruitless or irresponsibly reckless endeavor. Bowring clearly makes the argument that genes are not definitive of the human subject. However, his arguments that genetic biotechnology is ultimately reductionistic are insufficient to prove that it must be so. Genetic technology entails risks. But so does standing. Genetic technology produces changes beyond the mere body, as did the transition to upright posture. Ultimately, Bowring's arguments are left referring to a sacredness of the natural. Bowring states, "To reconcile the human being with the imperatives of an inhuman environment is to make that being a functionary of its environment, and of our refusal to change that environment or resist its allure in favour of a familiar, more human world." (p. 276.) If this were true, then one could not both treat and prevent cancer. Bowring's use of "reconcile" begs the question of whether reconciliation between the two is necessary. The cyborg is strange and appears unnatural. As humans expand their ability to use themselves as tools for expression, we must consider the impact on individuals and society. Following Straus' metaphor, the desire to improve is like the infant's drive to stand. As the infant becomes upright, his/her world is reinterpreted. Old assumptions are reassessed and new goals are set. Yes gravity remains to keep us grounded, sometimes to our regret. But that does not mean that the desire to fly is wrong. Bowring's text does a great job of pointing out many of the potential and actual risks of biotechnology. But his arguments do not prove that these risks are sufficient to justify limiting humanity's drive to include genes as another tool in creating the future. The value of this book is not in the ultimate soundness of the arguments, but in its ability to cause the reader to see the common anew. He interweaves science, culture, and economics into a complex antitechnological treatise that serves as a spark for further discussion. Despite its weaknesses, Bowring's book raises possibilities that should not be ignored. Karl Marx, The German Ideology, Pt. I, Tucker, R.C. Ed. in The Marx-Engel Reader, 2nd Ed., WW Norton & Company (NY & London: 1978), p. 150.